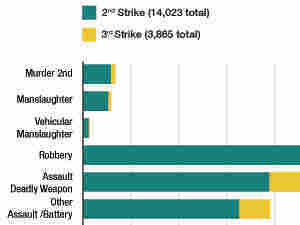 Cases Show Disparity Of California's 3 Strikes Law Not everyone who has been put away for 25 years to life under California's three strikes law has committed a violent crime, including two people convicted of stealing. Both challenged the law — and while one was released, the other wasn't as lucky. 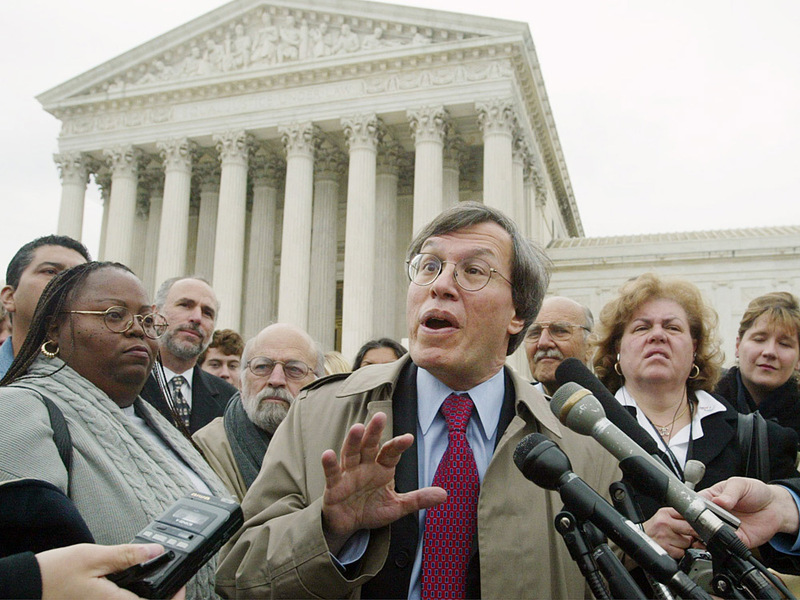 Erwin Chemerinsky, attorney for Leandro Andrade, chats with reporters outside the Supreme Court in 2002. Under the three strikes law, Andrade was put away for 50 years to life after stealing videotapes from two different Kmart stores. Chemerinsky challenged the case, and it went all the way to the Supreme Court. California's three strikes law has imposed some very long sentences on some very dangerous people. A third strike carries a sentence of 25 years to life and that sentence can be imposed for any felony, not just a violent one. Some people have challenged the law — but the results have been mixed. Take, for example, Leandro Andrade. His last offense was stealing $153 worth of videotapes from Kmart stores in San Bernardino, according to Erwin Chemerinsky, dean of the law school at the University of California, Irvine. Now, Andrade had had his run-ins with the law. He was a drug addict, and he had committed some residential burglaries years before. So when he stole those videos, it was a third strike, which could mean 25 years to life in prison. But because Andrade grabbed the videos from two different Kmarts, he was prosecuted for two third strikes. As a result, says Chemerinsky, Andrade was sentenced to life in prison with no parole for 50 years. Chemerinsky represented Andrade before the 9th Circuit Court of Appeals, which agreed that a sentence of 50 years to life for shoplifting was cruel and unusual punishment. But the Supreme Court overturned that ruling on a 5-to-4 vote. The majority found that Andrade's sentence was not disproportionate because there was still the possibility of parole — though he won't be eligible until he's 87 years old. "There's no question it was a setback; the result was very unfortunate," says Stanford Law professor Lawrence Marshall. Marshall has established a clinic where Stanford law students work to win the release of nonviolent third strikers. So far, they have persuaded state courts to release five men from prison. "The judges said that had they understood at the time of sentencing what we were now explaining about the nature of the offense and the background of the offender, that they should have recognized that it was a case that was outside the spirit of three strikes," Marshall says. The Stanford clinic takes very few cases and the staff picks them very carefully. They haven't represented anyone whose previous strikes included a violent crime, and the third strikes are always for minor offenses. Marshall wants to show the public what he views as the irrationality of the law. He cites an example. "You've stolen some socks from a store — and that's a real case of ours — that were valued at a few dollars," he says. "We are going to now imprison you at a cost of $40,000 to $50,000 a year to make sure you don't steal some more socks." Marshall hopes that publicizing such cases will lead to a change in the law. But three strikes has become so entrenched in California's criminal justice system that the political will to change it just isn't there, according to Mike Vitello, a law professor at the University of the Pacific and an expert on the three strikes law. "Most Democrats lack the courage to take the issue on," he says. "The governor indicated some willingness to do it and then he backed off. And I think the Republicans are totally cynical. They are waiting for the day when the Democrats are able to get some kind of sentencing reform. And then if anything goes wrong, they will accuse the Democrats of being soft on crime." One man serving a three strikes sentence decided he needed a miracle. Isaac Ramirez has been out of prison for seven years. He now works full-time at his church in Riverside County, east of Los Angeles, where he's a lay pastor and in charge of facilities. In 1996 Ramirez took a VCR worth about $200 from a Sears store. He walked out with it in broad daylight. He got caught, handed over the merchandise and admitted having done something "stupid." Unfortunately, he had taken some stuff from stores a few years before. He knew that was going to matter. He never dreamed how much. I mean, I've never hurt anybody. But I still broke the law and I understood I was gonna do some time. How much, I didn't know. "I mean, I've never hurt anybody. But I still broke the law and I understood I was gonna do some time," he says. "How much, I didn't know." Since taking that VCR was a third strike, he was sentenced to 25 years to life. While Ramirez was in prison, he rediscovered the faith of his childhood. "Having the word of God before me, I was able to obtain hope and understanding," he says. "It began to change me while I was in prison." Ramirez's path to salvation led straight to the prison law library. "I had to study both state law and federal law," he says. "I was very blessed in learning how to do both." Ramirez filed his own appeals, and there were many setbacks. But in 2002, a federal court finally ordered him released from prison. He reunited with his family and began working at his church. Then, it was the state's turn to appeal and argue that he belonged back behind bars. Ramirez didn't have money for a lawyer, but he decided he didn't need one. "God had brought me this far, so I knew that he would complete it," he says. So, Ramirez presented his own case before the 9th Circuit Court of Appeals. "Oh, that was an experience," he says. "We had half the church there. I couldn't keep them away." Ramirez needed the support because he'd been planning to claim cruel and unusual punishment. Just a few months earlier, though, the Supreme Court had shot down that argument in the Andrade case. Ramirez, however, stuck to it. He claimed he was more deserving than Andrade. "First of all, Andrade has more prison priors than I do, No. 1," Ramirez said. "He was on parole when he committed two additional crimes." Several times the judges referred to Ramirez in the third person, not realizing it was the man standing before them. Judge Andrew Kleinfeld didn't figure it out till the end of the hearing. "I had been thinking that you were represented, I hadn't realized you were pro se. But you've done a fine job for yourself," Kleinfeld said. Ramirez did such a fine job, he won his case and remains a free man. He says that when he was in prison, he met a lot of men who really did belong there. In fact, everybody NPR spoke to for this story thinks there needs to be a three strikes law, that some people should be put away for a long time — if not forever. The federal appeals court decided Ramirez wasn't one of those. But he so easily could have been.